Hi, my name is Maud Hyde. 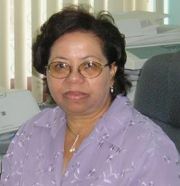 I am currently working at the University of Belize as Director of Open and Distance Learning. Prior to this engagement I worked for many years in the Ministry of Education at various posts ranging from teacher to Chief Education Officer. My current position allows me to continue to work in an area where much development is needed if we are to build new systems that will effectively reduce the numbers of untrained teachers in Belize's primary classrooms. As an educator in Belize, I wish to see much more being done to improve the education system, and would like to continue to be a part of any team working towards this end for many more years. I believe the University of Belize is doing a tremendous job educating teachers and other professionals for the Belizean workforce. The work never ends if we are to remain current and relevant in the global environment. Adopting distance education methodologies is most certainly one important way to provide access to higher education where distance and personal commitments may prevent persons in rural communities particularly from upgrading their education and training. I am pleased to be an advocate for more utilization of distance education methodoligies in education. Distance and open learning; Teacher Education primarily in the area of classroom assessment and measurement and evaluation; designing assessment instruments for primary level students. Although most people are familiar with Wikipedia, WikiEducator is a new experience for most educators in Belize. Within the University community here at UB, I mentioned WikiEducator to quite a few people and to most of them it is entirely new. Seeing this as a great opportunity, I consentrated on educating key staff members on the benefits of joining the WikiEducator community. The January 8 and 9 workshophosted by UB Faculty of Education and Arts staff training is a direct result of this effort. I am working on getting more people to sign up for free training as I am sure once they become engaged they will want to continue and be a part of the free content movement. This page was last modified on 22 April 2009, at 22:37.